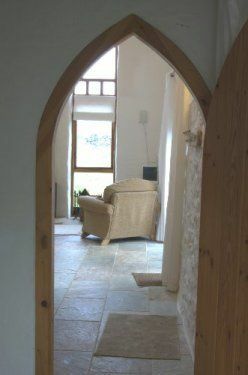 Harmony Barn is a comfortable, cosy eco holiday cottage sleeping up to four people in two spacious bedrooms. The downstairs bedroom of the holiday cottage has two large comfortable single beds with an en suite wet room and views from the large arched coach house window of the courtyard garden. The upstairs bedroom of Harmony Barn contains a king size bed with views from the windows of Garn Fawr and the surrounding countryside. It also has an en suite bathroom with a bath and shower. This is by far the best place we've stayed in, and we adventure around a lot. Fantastic little gifts of organic soap, milk and wine on arrival - just the best touch after travelling for 7 hours. The eco nature and wonderful homely feel of the place cannot be surpassed. Dan and Shani are such lovely people and so helpful - thank you for opening up this wonderful space. The self made door handles are gorgeous. We relaxed so much and walked loads. And you are right Pembrokeshire has some of the most amazing coastline. Our labrador (15months) absolutely loved it- just being able to run around the field and then laze around. Amazing if your thinking about booking somewhere to stay in pembrokeshire- this is your place. Its only 5 mins drive to the town with shops and pubs and places to eat. A blowy few days in Pembrokeshire! We had a lovely few days discovering this part of Pembrokeshire. We arrived just in time to settle down with the log burner whilst Storm Freya did her thing! The cottage was perfect for us and had easy access to the coastal path for lots of walking. Dan and Shani were very welcoming, and had lots of tips on where to go/eat. Wish we could have stayed longer. Felt like we actually managed to relax a little! 'Stones Cottages' were so accommodating. We were looking for somewhere to stay so as to visit our friends nearby but loved our cottage so much we wanted to spend more time there. 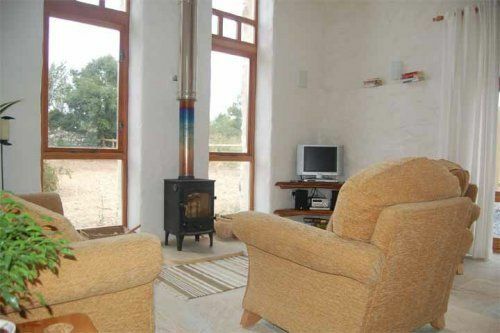 Our cottage had a double height sitting room area with log stove. Cozy and calm feel to the place. We were welcomed with a bottle of wine, home made flapjacks, proper tea, lovely local soaps, flowers and a jug of fresh milk. Plenty of blankets etc, well equipped kitchen, TV, radio, books, local maps etc. Very close to the coast. Dan and Shani were on hand when we needed and were super helpful. The cottage was beautiful, comfortable and cosy with all the finishing touches you could ever ask for. We were blessed with sunshine and had a wonderful time exploring this beautiful part of Wales. Thoroughly enjoyed our stay and chatting with our lovely hosts. We’ll be back in spring. lovely place to spend a few days, very relaxed atmosphere, owners make themselves available if you need it and always happy to chat, advise on things to do but also discrete. if I had one criticism it is the stairs up to the double bedroom - they are very steep and need to be taken carefully... other than that minor point, we loved it and would definitely come back. Harmony cottage was the setting for a great holiday. We thoroughly enjoyed our short break and plan to return next year. The location was perfect for us-quiet and peaceful with beautiful views. 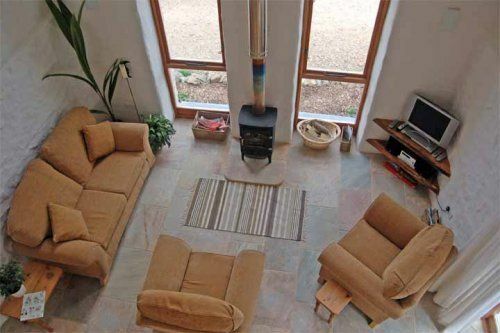 The barn conversion is very well done and has everything you need. The log burning stove is a lovely touch send it was great to be using water heated by solar panel. The owners had provided thoughtful things to help like milk, tea and coffee and even a bottle of wine! Highly recommended. We love Harmony, mainly because it's so cosy. Even in summer, we use the woodburner most nights, as it can be chilly in Pembrokeshire. The cottage is beautifully equipped and designed to a very high standard. Harmony cottage is a beautifully restored stone cottage in the most beautiful location. The welcome we received was genuinely warm and caring and we were well provided for on arrival with tea, coffee, milk and flapjacks. Stones cottages oozes a peaceful serenity and calm that contributed to a feeling of wellbeing and I slept so well on the comfortable bed. Stones cottages are a secret gem. I have booked a return trip already. Beautiful house and location, extreamly friendly and helpful hosts. Highly recommend! I had a wonderful stay thank you! Beautifully converted farm building in peaceful location. Very comfortable and very helpful host. My only reservation would be the staircase which requires care. Environmentally friendly barn conversion done to a high standard. Welcoming owners on site. Quiet and peacefull location close to Pembrokeshire coastal path. We had yet once more, a wonderful, relaxing stay in Harmony. It's a great place to unwind, to explore the magnificent coastline, the wild flowers and to walk the dog and then cosy up by the log burner. We had a very relaxing break in this beautiful well equipped and comfortable cottage. Lovely quiet location. The wood burner was great and made the cottage even cosier. Wonderful walks on the doorstep. Great to stay in an eco friendly cottage with solar powered hot water. Amazing! We had a fantastic short break in this gorgeous cottage at short notice. Dan and Shani and Brian and Dot look after your every need and are very accommodating. The cottage is a beautifully renovated barn conversion, spacious, light and warm with a cosy log burner and comfy sofas and chairs to relax in and on. The kitchen is extremely well equipped with lovely treats to welcome you. There is a pretty garden to sit in. Every attention is paid to ensuring the environment is looked after. There are great walks from the doorstep. We would absolutely love to stay again, thank you all. Harmony Cottage was perfectly located for us as we wanted to walk everyday and not use the car too much. Over the week we did several circular walks covering a good stretch of the Coastal Path. It was wonderful. The welcome from Shani and Brian was wonderful. and we really felt a part of something special. The level of detail in making the property environmentally sustainable was wonderful and greatly appreciated. We have come away really thinking about things we can change to improve our environmental impact. All this and the beauty of this area of Pembrokeshire what more could we want, so sorry we had to leave a little early because of priotr commitments. We will definitely be back! Harmony is a wonderful barn conversion for couples, friends, or families. We enjoyed every home comfort, as usual, and had the wood burner going every night except one, which makes for very cosy evenings. Highly recommended. A very comfortable cottage in an idyllic setting. 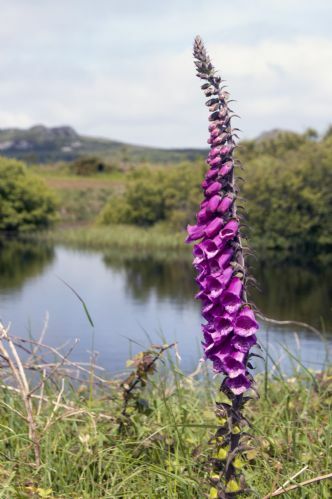 Surrounded by nature and close to numerous walks including the coastal path. The owners are very helpful and inspirational in their quest to create a green environment for all who visit. A beautiful, characterful, and cosy cottage which is in a wonderful location. We had a really enjoyable stay with our lovely hosts. Totally recommended! Great location,very comfortable. Good walking around Strumble Head with the help of the Strumble Shuttle. Cosy evenings in with the woodburner lit, having stocked up on local food in Narberth on the way down. Interesting take on the Pembrokeshire "Eco" without being spartan in any way. Had a really good time. A car is needed but the location is perfect for exploring Pembrokeshire. The cottage is spacious and light. The quality of the finishings were excellent from the fully functional kitchen, the shower, the comfortable mattresses and quality sheets. The wood burner was really easy to use and there's plenty of wood that you're encouraged to use. The owners ensure the basics in the kitchen like tea bags and sugar etc and also thoughtfully include a bottle of wine and home made flapjacks on arrival. The hosts were very hospitable and on hand as required. Couldn't fault it. Really good. The detail of the barn conversion was wonderful, and the owners very friendly. We thoroughly enjoyed our stay, even though the weather was very cold. It is a beautiful part of the world. We had a wonderful New Year week at the Harmony. Brian, Dot and Family were very welcoming and provided everything we needed. Our son was feeding the animals with Brian every day and it was clearly a highlight of his stay. The cottage was warm, cosy, with lots of little personal touches that made it feel very homely. We had the stove on every day and the free supply of wood was much appreciated. Walking the dog every morning was a pleasure as there are plenty of fields and paths available on your doorstep. New Years eve was sooo quiet - perfect for our pooch who loathes the fireworks. The atmosphere and ethos of the place made it a very special stay. Thank you! Very nice property for our family of four (including two girls aged 11 and 8). Clean with all amenities. Very nice having en-suites for both bedrooms. 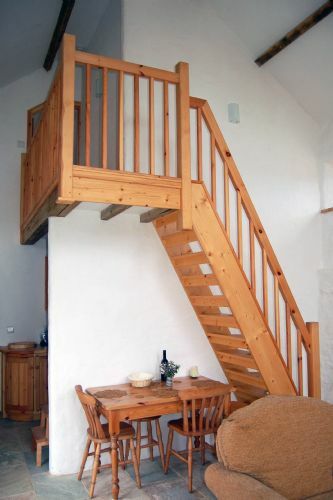 As stated, stairs to upper bedroom are steep so bear this in mind for people of lesser mobility (no issue for children we understand as owners can provide stair-gate (fixings for gate evident on wall so it must be a proper stair-gate and not one of the flimsier gates). Plenty of firewood to keep the fire going every evening and to warm up in the mornings. Very friendly hosts, ready to help when necessary. Environmental credentials are high! Working farm so expect farm vehicle traffic as well as work vehicles for continuing conversion of the farm buildings but nothing intrusive.Close to the beautiful coast (30 minutes to walk to the coast path following the path through the fields right outside the cottage). If you like clean air, deserted beaches, clear water of startling blues and greens, wildlife, relaxation, incredible nighttime skies, and nice walks, then this is the place for you!! Lovely place to stay with good hosts. Too hot under the duvet - but then needed the wood stove to heat us in the evening! Brilliant things nearby we were encouraged to go to - the Fishguard Folk night, the National Theatre live broadcast at the local cinema, and using the 3x daily bus to complete coastal walks. Wild Pembrokeshire - gorgeous. A wonderful location with Aber Mawr beach, our favourite, just 2 or 3 miles away. The hosts are really welcoming and friendly. The house likewise. So nice to have home from home eco products, organic cotton linens, etc. A Clearview woodburner, the same as our own, for cosy evenings in with the complimentary bottle of organic red wine. This is a beautifully appointed converted barn, that we booked for this year as soon as we left last year. We have booked in again for next year! It is spacious and cosy at the same time. The woodburner coming in useful even in August! 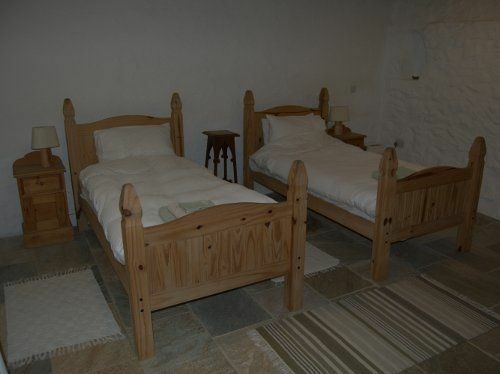 The ground floor has a large twin room with very comfy beds and en suite wet room. The kitchen, although small, has everything you would need, including dishwasher and washing machine. The sitting/dining room has a dining table and chairs, a big comfy settee and two big comfy armchairs, as well as the woodburner. And TV, video, DVD player... a large arched window provides lots of light. Outside at the back is a small area with table and chairs and lots of herbs and flowers. A sunny spot for breakfast. 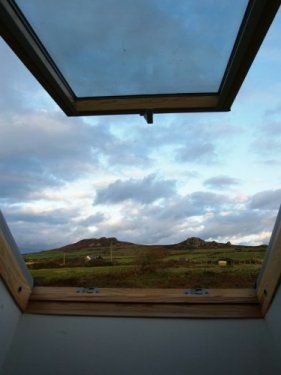 You can also sit outside at the front and enjoy the views down to St David's Head. The stairs are steep an not for those who are unsteady on their feet. 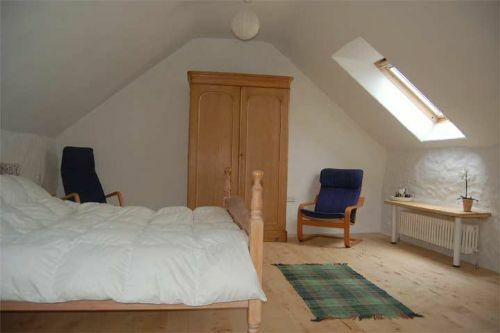 The bedroom is very spacious with a comfy good sized double bed, possibly king size.? The en suite has a Bette steel bath and overhead shower. There are lots of small details that really help on holiday; trays with cups, kettle, tea and coffee in both bedrooms , digital radios in both bedrooms, fabulous thick fair trade organic cotton towels, lots of bathroom organic fair trade products. The kitchen has all the things you may forget, like kitchen roll, foil and cling film. In fact t all those pesky things that I hate packing for the kitchen and bathroom are all there in plentiful supply and high quality. Bedding is gorgeous fair trade organic cotton. Dot and Brian are extremely helpful and accessible and will make sure everything is okay. The location is amazing, based on this small holding, with lots of neighbouring cows and sheep around and a resident alpaca, Boo. It is very peaceful and good for children and adults alike. Dot and Brian's grandchildren also live on the small holding, so there are plenty of delightful children for your children to play with. The cottage is dog friendly and the children loved our dog and pressed their noses to the car window to say good bye to him when we left! There is masses to do in the local area, especially if you love the great outdoors. There are lots of good places to eat and Fishguard now has a good butcher and fishmonger,as well as a good grocer and two weekly markets held in the town hall! If, or when, it rains, Brian and Dot will give you ideas. We went, on a very windy day, to the Gallery at the tourist office in St David's and saw a touring exhibition of Constables, Pipers, Turners and Sutherland's, which was amazing. It's also lively just to hang around the cottage and read, if that's your thing. Lastly, the sunsets are amazing and we went to Strumble Head every evening, rain or shine, just to sit and watch the sea and sky ...... and the odd seal. Wonderful place to stay in incredibly beautiful remote surroundings - will definitely be going back. It's so good I would be tempted not to tell anyone so it doesn't get booked up before I can plan my next holiday. 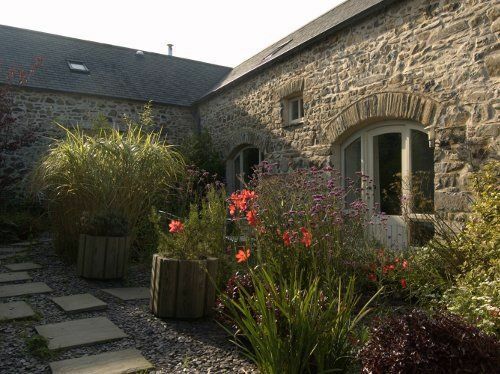 Harmony Barn at Stones Cottages was a very enjoyable place to stay for our 2-week holiday in Pembrokeshire. Ideal location for exploring the local area and the Pembrokeshire Coastal Path. Actual barn itself was cosy, but immaculate and some lovely personal touches from the owners, bottle of wine, homemade flapjacks and fresh flowers - very thoughtful. For our family of four (2 adults, 2 kids) it was ideal, and lovely to come back to after a day out. The log burner was welcome for the odd chilly evening also. One note of caution for any slightly less mobile person is the steepness of the alternate risers up to the double bedroom and en-suite. For us it was not a problem at all, but would recommend that this is mentioned in any promotional website or literature just in case it is a problem for some people. Otherwise, we would have no problem in recommending this property - the owners were incredibly helpful and thoughtful, and it felt like nothing was too much trouble for them. We had a lovely stay at Harmony. Brian and Dot were truly remarkable hosts. The cottage was lovely and catered for my allergies to chemicals using Ecover products. One word Amazing. Lovely cottage with great owners. Location is good but 10 minutes away from nearest town. Good beaches nearby for kayaking, relaxing and walking by. Cottage was clean and the welcome package of wine, milk, tea, coffee and cake was a pleasant surprise. Cottage has wifi which was a blessing as no phone signal in cottage. Small garden which had table and chairs to relax. Very quite area. 1) Pillows and duvet were in feathers, which we were allergic too. Spoke to owners and they resolved issues and are taking this forward for future guests. 2) Staircase to top floor bedroom was very steep and could do with anti slip patches on the alternating steps. Staircase is not a normal design - half step alternating left to right design. 3) Recycling and waste disposal instructions unclear. 4) Wifi password was unclear but resolved when spoke to owners. 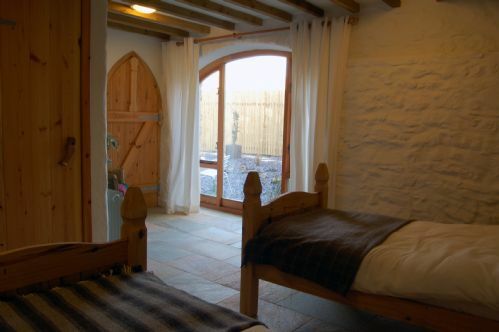 Stones Cottages are in the most wonderfully peaceful corner of Wales, and the owners are friendly and helpful. The local lanes are overflowing with a huge variety of wild flowers; the fields are full of sheep, llamas, horses, cows, rabbits... We even had some rain-free days - glorious! I would have scored excellent on everything if not for a ventilation / drainage issue in the downstairs shower-room causing a slight damp smell; and some friendly resident spiders - although; I suppose killing spiders is not the done thing when being Eco friendly. What a fantastic place in the middle of the countryside but close to the sea. The converted barn is beautifully designed for both space and comfort, with tall windows in the sitting room from ceiling to floor and a log burner for cosy evenings in. We loved the thought that had been put into making the cottage so welcoming with vases of daffodils and snowdrops, the tastefully furnished rooms and the fire already roaring by the time we arrived on our first day. Brian and Dot have paid great attention to detail in making the cottage eco friendly and an absolute haven for relaxing, unwinding and enjoying the tranquillity of life. 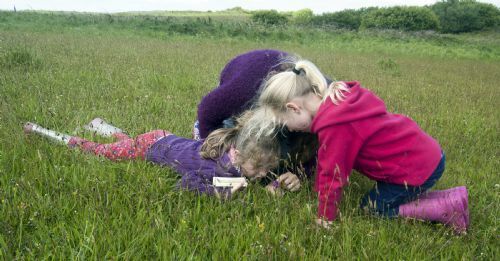 There is so much to do-walks along the coast, days out to beaches and countryside along the peninsula, St Davids, seeing a film at the little theatre which sells organic popcorn in Fishguard and much more. Or simply staying in with a good book if the weather is wild. Brian couldn't have been more friendly and welcoming and helped to ensure that we had a really lovely holiday. I'm sure we will be back. A great discovery! Welcoming, comfortable, relaxing and a beautiful place for a holiday. Dot and Brian were incredibly welcoming and the cottage is very comfortable indeed. The level of detail that they have put into making Harmony barn, the kind of place that they would like to go on holiday to, makes it a very relaxing place to stay. We really enjoyed using the wood burner (with all wood included). The bedding was luxurious and the beds were extremely comfortable. There were lots of nice touches, like organic toiletries, and the kitchen was stocked with lovely organic cooking oils, and a vast array of teas and hot drinks. We were welcomed with a plate of home-made flapjacks and a bottle of wine, both of which were delicious. We also opted to have a veg box, for a small extra cost, and this was of extremely good quality and highly recommended. The location is great, views of Garn Fawr, and lovely footpaths to the coast straight from the cottage. 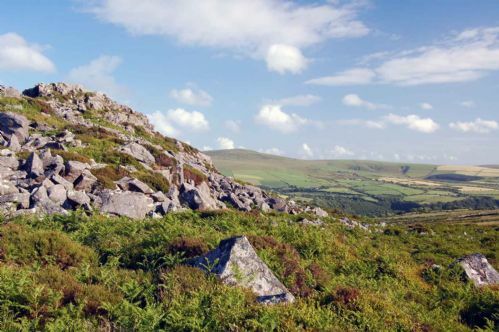 Stumble Head is a beautiful place for a holiday, lots of wonderful walking along the Pembrokeshire coast path, with plenty of wildlife to spot, and beaches to explore not too far away. We came on holiday with our two children (aged 5 and 3) and it was perfect for them. There were animals to feed, fields to run in and toys and games in the cottage. Walking locally was no problem, and they built up to longer walks over the week. Having things like Seals to spot on the coast walks helps too! We were not familiar with this part of Wales, we were expecting the coast path to be spectacular (and it is), but it was a pleasant surprise to find how good the quality of the food is, both eating out and from local shops and markets. The cost of the stay was very good value, and this has got to be one of our favourite holiday cottages that we have stayed in. All in all, Stones Cottages was a great discovery, and we are planning to go back as soon as we can! We had a wonderful holiday here, despite lots of rain- the woodburner was particularly welcome. Dot and Brian were very welcoming and helpful. The converted barn has been done to minimise impact on the environment and to a very high spec. 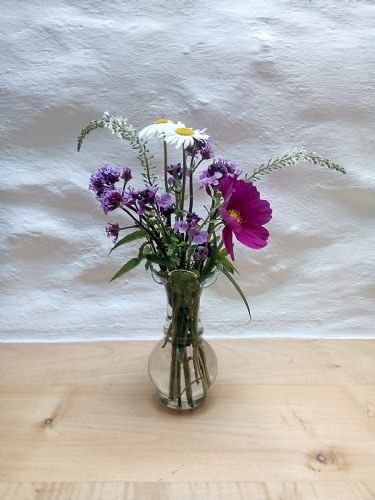 There are lots of small details that add to the atmosphere of the place- like Dot putting fresh flowers around, warm blankets on chairs, and a host of organic/fairtrade products to try out. THe views from the front [outside] are stunning. It is so peaceful and relaxing- a place to get away from it all. 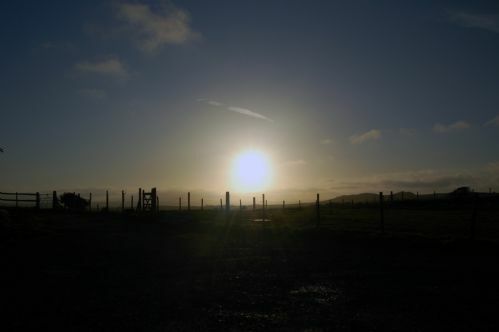 The barns are in an lovely setting, with long ranging views to the coast and some excellent walks within a few miles. The owners are lovely people and will be happy to give advice on the surrounding area. The barns are all eco friendly as are the animals, especially the Alpaca (Boo) and Hamish the goat. Well worth a visit and you should not be disappointed. Dot and Brian gave us a warm welcome. They have created a wonderful place to stay - the barn was imaginatively converted and was spacious and comfortable. Little touches like the provision of shampoo and other toiletries was very welcome as was the Running Duck wine ( and not just a welcome bottle but one for our second week too). It was great to be able to walk to the Coast path from the cottage. We also enjoyed visits to St David's, Fishguard and Newport - all within easy reach. Very well-equipped modern, eco-friendly facilities. New appliances that work well! Nice touch of providing fair-trade products (drinks, personal care and cleaning). Herbs growing outside the cottage door. Location excellent for local walks. Lovely views. Own transport beneficial for going further afield. We had our car. Two to three buses a day. Owners live on-site are very willing to offer items from their own kitchen to save the trek to town for forgotten items.